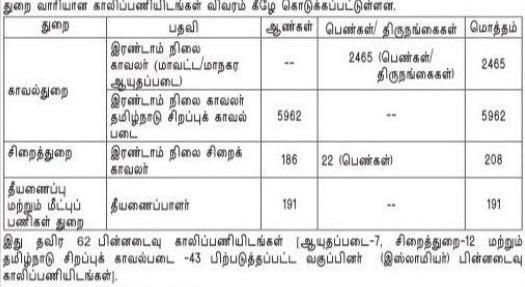 TNUSRB Constable Recruitment 2019: Golden opportunities for those candidates who are want to make their career in Police Sector in Tamil Nadu state. Now candidates can apply for TN Police Constable Recruitment 2019 through the online application form before the last date. The Tamil Nadu Uniformed Services Recruitment Board has announced the 8826 posts of Tamilnadu Police Constable Notification on their official website The TN Police Constable application form available from 08th March to 08th April 2019. Candidates who are Eligible and interested in the available posts can fill the Tamil Nadu Police Application Form via Online mode. (तमिलनाडु पुलिस भर्ती): Numerous numbers of candidates are going to recruits for the Constable, Jail Warders and various posts who are eligible. 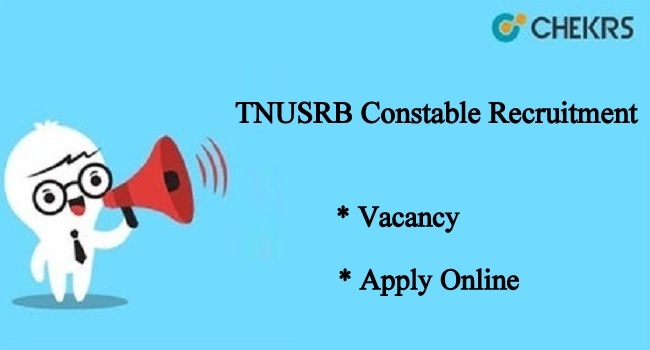 Every year, the recruitment department releases the advertisement of their official website and TNUSRB Constable Online Application Form 2019 for the TN Police Job Vacancy. The TNUSRB will be invited well-skilled candidates very soon for the Tamil Nadu Police Constable Recruitment 2019. According to official notification, candidates can check all details about the Latest TN Police Vacancy. As per the official notification, the application process for the Constable, Jail Warders will be completed in online mode. Candidates must scan their photograph, signature, and documents which are necessary. The TN Police Constable Online Application will be finished before the last date after that the form will not be acceptable. During the application process, candidates should deposit the application fee via online mode. You can also check the Tamilnadu Police Constable Vacancy details from here. Before applying, candidates need to check their eligibility criteria for the available posts. For General Category: Candidate’s age should be between 18 to 24 years. Eligible candidates go to the official web portal of Tamil Nadu Police. Check the SI/ constable Recruitment Link and click on it. Read the whole notification details and follow each instruction. Complete the online application process with full details. After completing the application process, you can take a print of application form for the future uses. The Tamil Nadu Uniformed Services Recruitment Board is going to announce the Tamil Nadu Police Recruitment Notification to fill up the various posts in different departments. Well skilled and interested candidates can apply for SI, Constable, Head Constable, Home guard etc. posts via online method. You can also check here, TN Police Exam Syllabus and Tamilnadu Police Previous Papers with full details. Candidates are advised to keep in touch our web page www.jobs.chekrs.com and can get the Latest TN Police Recruitment Notification Details. You can ask any query about the TN Police Vacancy in the comments box that is given below. just make a confirmation regarding SI Call Fare details either it is in the year 2018 or 2019? ?